Phoenix offers many options for odor control, as our technicians are certified by the IICRC (OCT) and are experienced in combining several different techniques for finding fast and effective solutions to any odor problems. Odors are important sources of information; the odor from a fire, detected in time, can save lives, while the smell of “rotten eggs” can help prevent an explosion. That is why natural gas contains an additive called ethyl mercaptan, which has a strong sulfur smell. For a disaster restoration technician, musty odors or the smell of dampness can indicate a mold problem, and a well-trained nose can locate the source of many of these problems. For this reason, it is imperative that an intervention is immediately scheduled, rather than temporarily disguising the problem by spraying perfumes in areas affected by disagreeable odors. Disguising agents will diminish the olfactory clues that are very helpful in detecting and locating certain problems. How do « odor neutralizers » work? The theory of the stereochemistry of odors is that the nose smells odors much like eyes see color. 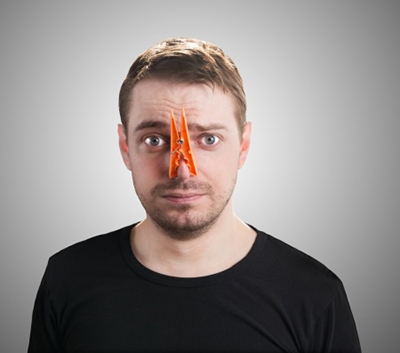 While certain trained noses can smell, locate, and identify hundreds or even thousands of odors, most people only smell odors that are outside the olfactory frame. By understanding the theory of the stereochemistry of odors, it is possible to combine stronger but complementary odors with a disagreeable odor in order to neutralize it. Why are so many deodorant products citrus-based? Because they are most frequently used to mask odors in the bathroom! Remove the source of the odor, if possible. For example, remove pieces of burnt wood after a fire.Dilute the odor by way of forced ventilation. The use of suctioning hoods or negative pressure is a common example of this technique.Oxidize residual odors. Ozone generators, hydroxyls, or oxidizing agents such as hydrogen peroxide.If the odor persists, modify it. It is at this stage that masking agents or perfumes are used. Using absorbing agents (allowing the absorption of liquids, vapor, and gas) such as activated carbon is also extremely effective when the odor's source is located. Odors are actually molecules, and they are not all equal. A protein fire, for example, produces extremely resistant molecules that are difficult to block out. However, the right cleaning products that target those types of odors have been developed, which allows for the restoration of damaged buildings and objects. Air currents in structures such as wall cavities, mechanical shafts, air ducts and floors, and between ceilings and roofs can move odors away from their source and make technicians' work more difficult. Since the last few decades, the use of Volatile Organic Compounds (VOCs) in the production of furniture, construction materials, and other products has seen a marked increase. Thousands of VOCs are present in our interior environments, and some people have sensitivities to them. There are ways to accelerate the dispersion of VOCs in new buildings. The use of intense heat and ventilation in a controlled cycle, for example, can be effective in reducing the discomfort of occupants who are sensitive to VOCs. Of course, the best solution is to use materials with the least amount of VOCs possible! For out-of-the-ordinary odor issues, trust an experienced team that will always end up finding the offending molecules! Unpleasant odors often indicate a potential danger. Bacteria from sewers, for example, are busy decomposing organic material. In doing so, they release methane and several other organic gases that stink. This decomposing action is essential to the management of this waste, but it isn't a danger-free environment for humans. Therefore, we have developed an aversion to odors typically related to decompositions. Whether it is cleaning up after a disaster, decontamination, or simply to control unpleasant odors, you can count on Phoenix's team to find a solution to your problem!